I learned how to use my bow. 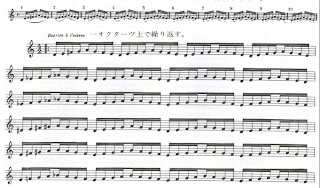 I learned how to play double stops confidently and comfortably. I learned that I love to play the piano. I learned that playing the piano can help my violin playing and my viola playing. I learned to love Mozart and Haydn in totally new ways. I learned that Facebook isn't all that bad. It fills a need in a fragmented world. I learned that blogging no longer has the community feeling it once had. I learned that in spite of the lack of community feeling, there are people who appreciate what I write here. I learned that there are also people who enjoy playing the music I write. I learned that things I do like can change. I learned that things I don't like can change for the better. I learned that it really doesn't matter. Sherman Walt, the former principal bassoonist of the Boston Symphony Orchestra decided to learn to play the viola when he retired. He bought an instrument from my father, and had a lifetime of making reeds and playing solos moving towards his rear-view mirror. I was devastated by his sudden death in 1989 at age 66 when he was struck by a car while walking across the street in the Chestnut Hill section of Brookline. 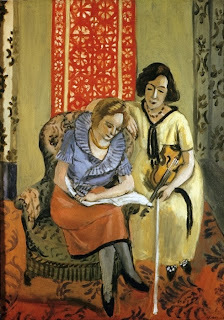 Reflecting on Mr. Walt's desire to play the viola was one of the things that gave me courage to become a string player. I told myself that as soon as I found a steady job I would start playing a string instrument again. 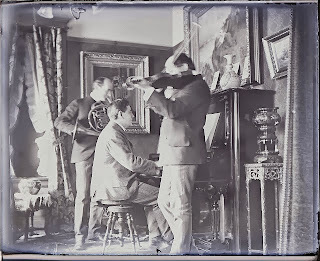 I remembered noodling around on the viola that my father would sell to Mr. Walt, and I felt a special connection. Even a responsibility. I suppose I can say that the job I got at the university radio station was steady. Year after year the powers that "were" suggested that my job was slated to be a full time job, but year after year I ended up being paid for just 15 hours per week. I though that those 15 hours came without benefits, but one important benefit came as a surprise. After twelve years in the job (regardless of the meager number of hours), I became vested in the university retirement plan, which in Illinois is the state retirement plan. I left the job (for reasons too complicated to discuss) after 13 years, and a portion of the small amount of money that I have drawn over the years since leaving the radio station (teaching at a community college) has made its way into this fund. The upshot is that when I officially retire I will probably "make" more money than I have ever made as a working-age person (not that it's enough to live on). The "steady" aspect of the job, and my personal vow made it possible for me to find a very full musical life after a frustrating one as a flutist without prospects, and keeping that promise to myself has become its own great reward. That's not the point of this post, however. The point of this post is that viola may not be a usual retirement for bassoonists, but is a common retirement instrument for violinists. 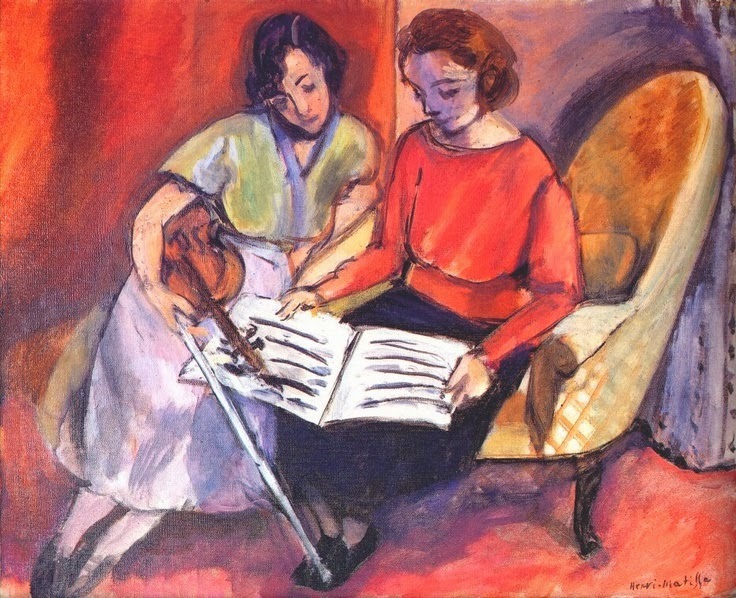 Some go to the viola because the high register of the violin becomes physically difficult to hear, and some go to the viola because they imagine that viola parts are less demanding than the first violin parts in chamber music and in orchestra (many are). I know from experience that playing the viola can be physically taxing, and I also know from experience that the strain on shoulders and elbows grows as the body ages. I know that vibrato slows down and that hearing changes. 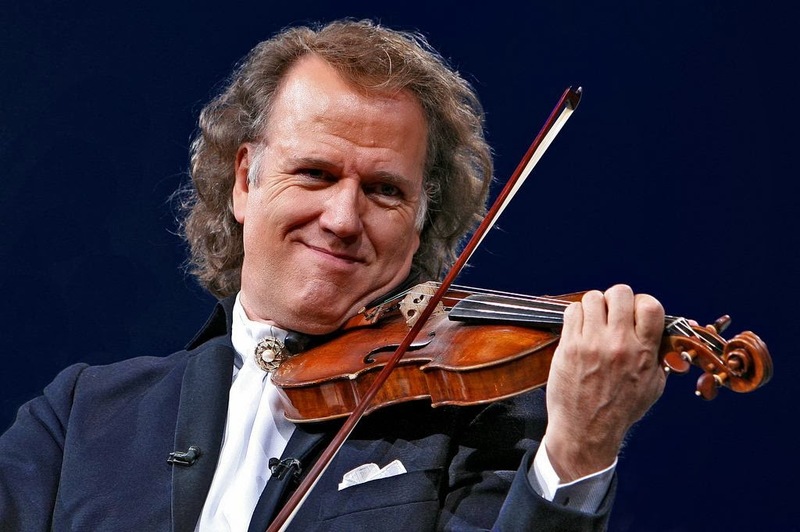 I know that the pleasure of playing both the violin and the viola has a lot to do with having the hands and arms respond quickly to the musical landscape, and I know that eventually the response begins to slow. I have many older friends who can no longer play. I know that I could not bear to not make music on a daily basis, particularly when I get into my 80s and 90s, and the world as I will know it will be as drastically different for me as it is now for my friends in their 80s and 90s today. It is for that reason that my preparation for retirement is to continue my daily piano practice, and approach the instrument and its music seriously (it isn't hard to do at all). I imagine that when fiscal retirement comes, I will be one of the few people around to have a pension without ever working steadily for more than 15 hours a week. I imagine that when I reach the age when I will have to put down the fiddle and bow, I will be a pretty good pianist. I will also probably be able to get along fine without ever developing any kind of virtuosic technique. I will have a built-in excuse: I'll be old. But I'll be happy in my musical company. These cookies use the exact same dough as my 30-Minute Hamantaschen recipe. I guess these have become a holiday tradition in our house. 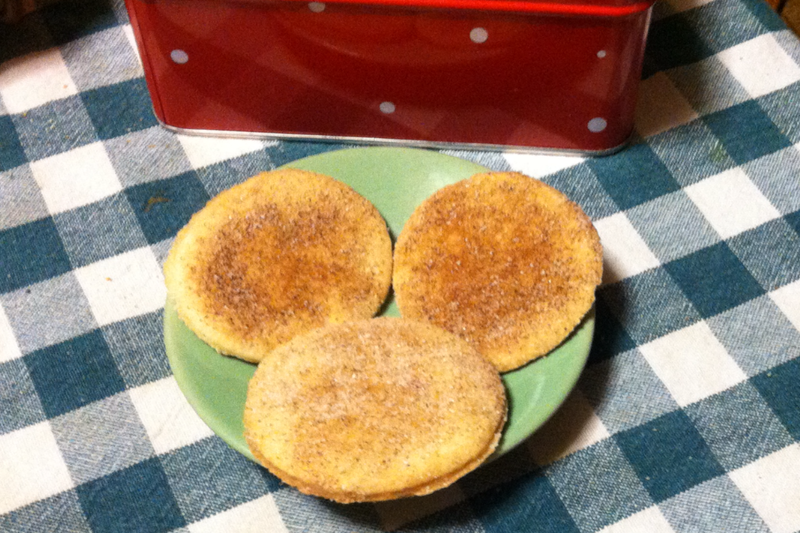 This evening my daughter Rachel and I made them as round crisps topped with cinnamon and sugar, and they taste great. This dough recipe makes about two-dozen cookies and uses two cookie trays that I line with parchment paper. You might notice that the ingredients in the dough, with the exception of the salt, descend in a ratio of two to one. In order to make these cookies in 30 minutes, you need to locate a rolling pin and a glass to serve as a cookie cutter (I used an 8-oz juice glass this evening). Preheat the oven to 350 degrees, cut the parchment paper and place it on your cookie sheets, and you're ready to go. You can, of course, use any kind of cookie cutter you like. Mix all the ingredients with a spoon, adding the soymilk last, a bit at a time, and knead the dough for a minute or two until it is smooth. Roll it out on a floured board so that it is fairly thin, and cut it into circles. Put the circles onto your parchment-paper-lined cookie sheet (you can put them fairly close together because they don't rise), sprinkle the circles with a mixture of cinnamon and sugar, and pop them in the oven. Let them cook for 11 minutes, and then use what remains of your 30-minute time period to let them cool so that they become crisp. N.B. Some people refrigerate their cookie dough before rolling it. I find that when I use oil rather than butter (or a butter substitute) in cookie dough, refrigeration doesn't make any difference at all in the way the dough handles or tastes. I just put this arrangement into the Petrucci Library. You can listen to a computer-generated recording here. This setting for strings is actually older than the setting I made for four guitars back in September, but it only made its way into its final form yesterday. Yes, the little nod near the end to the Jupiter Symphony (which you can't really hear in the guitar version) is intentional. I have always enjoyed listening to Chopin, and confess that when playing in the orchestra for his piano concertos, I can get a little bit emotionally connected, but I have never felt about Chopin the way I did yesterday. I have been filling in the pianistic gaps in my life by playing the piano every day (with limited exceptions). First there was Haydn. I went through the Haydn Sonatas with my limited technique, and marveled at the genius of the man as a composer. Then there was Mozart, and I started to understand about how it feels to play particular harmonies, and how they sound different when they are coming from my hands. 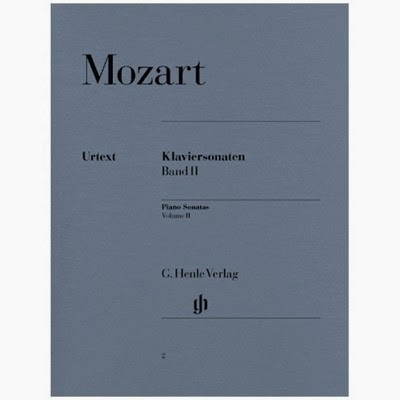 I admired (and still admire) the harmonic audacity of Mozart, and the way he manipulates form (and coming to know that there will usually be some more development in the recapitulation). Then I noticed how differently Mendelssohn made the piano sound from Mozart and Haydn, and wondered how this was possible. Perhaps it has something to do with Beethoven, a composer I feel I am still unequipped to meet personally through his piano music. My brother's piano music (that I brought to Illinois with me from my father's basement a few years ago) included a volume of Chopin Mazurkas. I thought I'd try one or two in order to learn to use the pedal. Now I have Chopin cravings. I wake up in the morning, and I want to play Chopin. The Mazurkas have a lot of repetition, so after the tenth or twentieth time playing a particular figure, my hand begins to learn it. My left hand wants to go to those singular, strange harmonies found in regions of the piano that Chopin bushwhacked, and my right hand wants to pounce, cat-like, on those non-chord tones, and then bring them to their resolutions, no matter where they lead. I have heard great pianists play Chopin, and I have enjoyed listening immensely. But it is different when you can play it yourself. My Chopin will NEVER sound as good as Rubinstein, Horowitz, Argerich, Richter, Pressler, or even your average high school or college piano student, but that's not the point at all. The point is that playing Chopin is a different experience from listening to it. I grew up in a household of excellence. I took excellence for granted. My parents and brothers were far smarter than I was, and they seemed to be able to do things that I just couldn't do (like math). I remember wishing that I had a different kind of mind than I had (or have), so that I could operate in their intellectual and musical ranks. I also had friends in high school in Newton who were fantastic musicians, and the Greater Boston high school musical scene was packed with people with extraordinary talent and ability. I had people to admire who were New England Conservatory students, and people to admire in the Boston Symphony. I had my musical heroes very close to home. I figured out how to fool people pretty early on. I could hold my own in adult conversation when I was a teenager, and I could use my highly developed intuition to give people the illusion that I was smart. I was on a personal search for truth, and I read a lot about music. I also loved music deeply. I did see myself as having certain advantages through what one person on the outside referred to as my "breeding" (though I would never use that word myself), and I fought vigilantly to break down the barriers that got in my way. Some of those barriers might have been imaginary, but a good many of them were real. It was pretty crazy for me to feel that if I began playing the flute in the seventh grade (a late age in a competitive field), I could, through sheer perseverance and hard work, rise to the top of the "pack," and get into a good school as a performance major. I thought that if I worked harder than anyone else, it would make up for what I lacked in experience and brain power. Ultimately, I confess, what got me into Juilliard was my "breeding." Julius Baker taught my mother, and he admired my father's playing. I also studied with one of his students. I managed to fool him with my amour of charm, and, after being initially rejected because of my less-than-perfect orchestral audition (the first of many), he pulled some strings and got me accepted. I never really felt like I belonged at Juilliard, until I found out that my path there was not all that unusual. I still think that my audition for Baker was a brilliant "wool-over-the-eyes-pulling" moment. I played the slow movement of a Mozart concerto, and I prepared my interpretation by listening to Julius Baker's recording of it. Every time he changed color, I made a little mark in my music. Those were the places I changed the color of my sound or made some kind of musical inflection, but I intentionally didn't inflect the same way he did. I intuited that those places were moments of sensitivity for him, and I suppose I was correct. I suppose that getting into Juilliard became a mark of excellence. I was surrounded by people who were excellent players, and made friends with people who were fine musicians. I was a champion practicer. I have applied my late-starter mentality to everything I have done musically: learning new instruments, writing about music, and writing music. I love having a long road ahead of me, and I love encountering real brilliance and real talent, but now, at the age of 54, I'm starting to understand my limits. I am turning more into a consumer of music than a producer because there is so much to play, particularly on the piano, that is far greater than anything I could imagine writing. Specializing has never been my strength. I am polyamorous as a musician. I can't commit to a single instrument or a general era. I can't commit to writing in a particular style. My tastes go all over the map. I admire those who do specialize, though. I also admire people who can write about music in a compelling way. 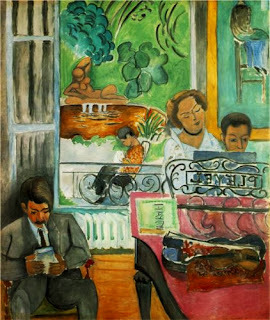 "The emotional satisfaction one gets from putting the right chord in the right place can't be equaled in any of the arts," he wrote exultantly in 1915, after a year of blocked inactivity. "Forgive me. I sound as if I've just discovered music. But in all humility, that's rather what I feel like." So ends my ramble. Perhaps I should go and do something productive. Or read more Taruskin. I just read a post on On An Overgrown Path concerning the fact that wealthy people who sit on boards of major music festivals are the people calling the shots about the future of "classical" music. Some of us who believe in social justice observe that some of the people who love music as much as we musicians want to play it (and write it) are of a very different kind of political mind. Sometimes that different kind of political mind is one that acts exploitatively and manipulates politicians. One big problem that we face is that often times people who have extreme wealth lack taste. This happens among people who don't have wealth as well. Money can't buy taste. Unfortunately. It can buy instruments, excellent instruction, and even influential friends, but it can't buy talent. So the future of classical music is like a volleyball passed between people of serious financial means who love music deeply, and those that have personal preferences that may not have much to do with anything that lies below the surface of the combination of good looks, a flashy (and reliable) technique, and stage presence (in composers as well as in performing musicians). I know that as a working musician (performing and writing), who is not of the flashy ilk, it is not likely that I will see vast sums of cash and support come my way (miracles can happen, but I'm not holding my breath). But I do know that if a "culture maker" were to ask me for something and reward me with exposure, press, accolades, and money, I would probably do my best to deliver whatever it is they ask of me. This morning I was practicing double stops on the violin. I always seem to have more trouble playing double stops on the violin than on the viola because of the strong presence of difference tones in the upper register. Sometimes I feel like I have to "fight" a great deal of "noise" just to get them to resonate evenly. Then, out of the blue, I got an email message from David Mendes, a person who reads this blog, with a link to a dissertation about Lucien Capet. Capet's analysis of the way the bow works is fascinating, and also extremely useful. This image, however, proved to be a revelation for me. The gist of the image is that when playing different double stops it is best to put the weight of the bow in different places in order for them to sound properly. It has nothing to do with the musical direction of a phrase, or voice leading, though sometimes a nice coincidence does happen. It has everything to do with the ease of getting both pitches of a double-stop to sound and resonate. When you play the interval of a second, you put more weight on the lower string (or pitch). When you play the interval of a third, you also put more weight on the lower pitch, but you don't need quite as much as you do for a second. A fourth is only slightly weighted to the lower pitch, and a fifth is exactly even. 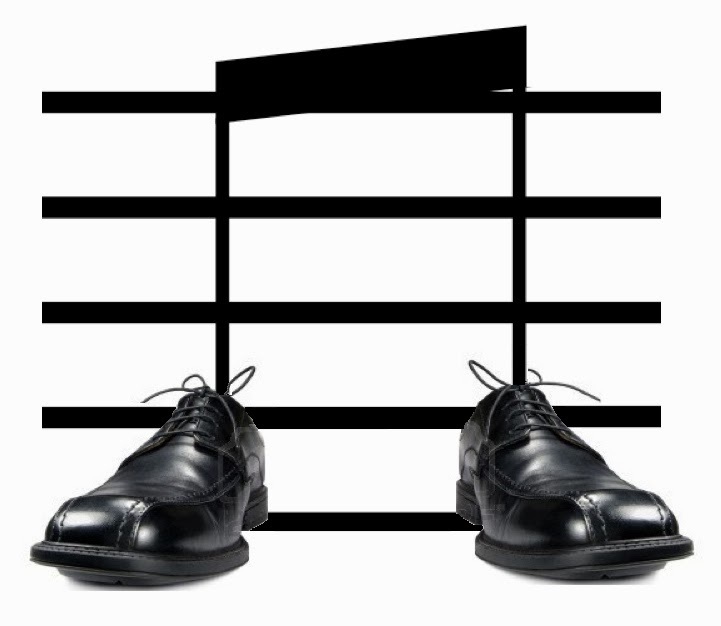 For sixths, the weight goes toward the higher pitch, and for octaves even more weight goes toward the higher pitch. The most weight goes to the higher pitch for ninths and tenths. I just tried this with solo Bach, and found the results remarkable. It really makes you think and feel. It's so much easier to make music when the double-stops come out sounding clearly. There's a German edition of Capet's La technique supérieure de l'archet in the IMSLP. Alexander Schneider is the violinist; Julius Levine is the bass player; David Oppenheim is the clarinetist; Loren Glickman is the bassoonist; Robert Nagel is the trumpet player; Erwin Price is the trombonist; and Alfred Howard is the percussionist. The film is from 1954. I suppose I put in a little more time at the piano today than I have in recent days. I usually limit myself to one or two movements of Mozart and one of Mendelssohn's "Songs Without Words," but today I got a bit carried away because playing the piano has become my latest exercise in irresponsibility. I guess I played two whole Mozart Sonatas, and then, just for fun, I played some Haydn. The beautiful thing is that it's just about me and the music, and I can play as slowly as I like. When I make mistakes, I go back and correct them simply so that I get to hear the right notes in the right order. I'm not practicing when I play the piano. I'm playing. But I am getting better at playing, and I find that I don't need to look at my hands as much as I used to. I also don't tense my shoulders anymore, and I find that I can breathe normally while I am playing. Don't get me wrong: I love practicing the viola and the violin, but I crossed the threshold of responsibility years ago. Now it is always a responsible act, and practicing does often feel like hard work (not that there's anything wrong with hard work). Now that I have developed my daily piano routine, I look at music differently when I am away from the instrument. I look at piano music much more physically. I imagine myself playing it, and consequently I hear it more clearly in my head as piano music rather than as notes and chords. 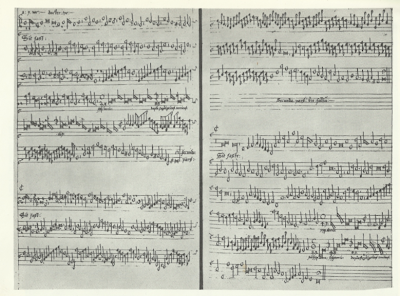 My friend Dan Barrett introduced me to this extraordinary recording of Bach's Partita No. 1, and I'm sharing it with you. The pauses between movements are a bit long, but the wait is worth it. Here's Fiorentono's obituary, and a link to all of his recordings on YouTube. Here's one where he plays whatever comes to mind, including the beginning of the Mendelssohn Violin Concerto, "Some Day My Prince Will Come," a bit of Gershwin, and some Paganini, followed by a paraphrase. A few words from Lorin Maazel to those of us who "march to different tunes." Lorin Maazel has been around. He has enjoyed celebrity for all of his professional life, which happens to be most of his physical life. He made this post on Facebook, which I think readers here might appreciate. I'm sparing you the photograph. Living in the backwaters of the Arts, I have to rely on services that inform the public about things that matter, like Yahoo's "Trending Now". I thus can keep abreast of significant events such as Kim K. not wearing underwear. We classical musicians wrestle year after year with the intricacies of orchestration, the philosophical implications of a phrase, the challenge of matching sonorities of orchestral groupings, the agogic of an interpretation, the goal of identifying a basic tempo for each composition performed, plotting rehearsal strategy so that maximum results can be achieved within the confines of a pre-determined time frame and adapting to acoustical properties of each venue for maximum effect. How comforting to know that there are millions out there who tremble at the very thought of KK's skin, her every word, her boyfriend. How foolish I feel never having heard of the lady until a few weeks ago. More power to her. May she enjoy the clout given her by worshiping fans. Tempted as I am to chuck it all in favor of hoping to share a KK Selfie, I seem to be unable to distance myself from the Titans of Classical Music. 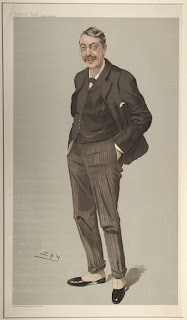 This week I'm having a bout with Richard Strauss. I'll sum up my impressions in a separate posting but I'd like it to be known that as admirable as underwear-less Kim's moving through the ether of the real world may sound, there are still a few of us who march to different tunes. 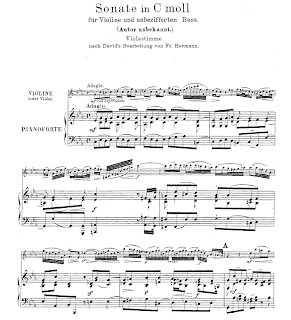 Violinists and lovers of violin music will be happy to know that I just put two editions of Amanda Maier's Six Pieces for Violin and Piano on her page in the IMSLP Petrucci Library The first is a scan of the 19th-century original, and the second is a modern "engraving" edited by the violinist Gregory Maytan, who has made excellent recordings of both the Six Pieces and her B minor Violin Sonata. 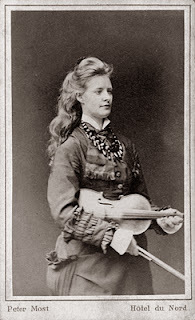 For readers new to Amanda Maier (1853-1894), here are several posts I made about her over the past few years. I am happy to report that Maier's Swedische Weisen und Tanze are also in the IMSLP, along with these pieces and her Sonata. Here's a link where you can buy Gregory Maytan's recording of the Sonata and his recording (the first and only, so far) of the Six Pieces. I was thrilled when the members of the SkyeProMusica asked me to make a transcription of my Skye Boat Fantasie for their ensemble, and am happy to let you know that they will be performing it on their Winter concert next week. Classical chamber trio SkyeProMusica will be performing works by Reinecke, Martinu, Rachmaninoff, and a world premiere of a work called Skye Boat Fantasie, transcribed for SkyeProMusica by the composer, Elaine Fine. Performances will be on December 6th at St. Margaret's Episcopal Church on Rea Rd in Union County, and December 8th at 2:00pm at St. John's Episcopal Church on Carmel Rd in Charlotte. You can get additional information here. When I lived in Schladming back in 1980, the very small Austrian city had a tiny library. There were only a couple of English books in it, so A Farewell to Arms was a relief to read since I spent so much of my life communicating clumsily in German. As an expatriate I suppose I connected with the protagonist, and as a young person I suppose I connected with the intensity of the love relationship (based, it seems, mostly on an attraction I would now consider kind of superficial). There are phrases here and there that I find evocative. (Notice that I didn't say "charming.") The short sentences without much in the way of punctuation are also a bit infectious, but as a 54-year-old I just can't stand them. I have this terrible habit of picking up the prose style of fiction writers, so I think it's a good idea to donate my copy of the book to the hospital library, and be done with it. I love hearing the music in the voices of people speaking languages I do not understand. I haven't been posting for a few days (and won't be for a few days to come) because I am spending my days in the hospital keeping Michael's father company while he recovers from an operation. 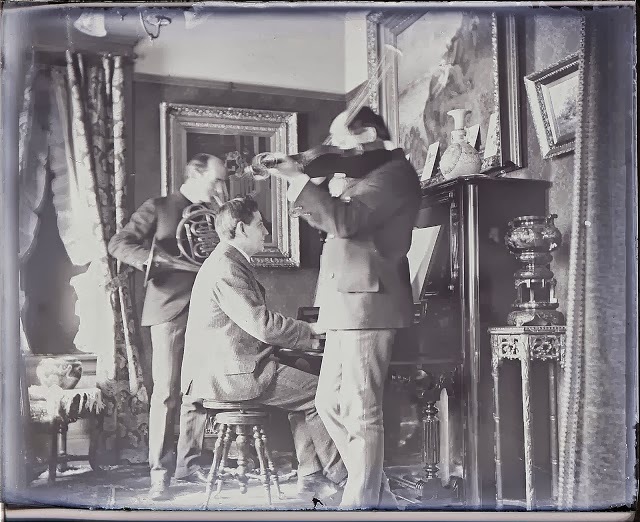 It is very difficult to be away from my instruments, and my good friends Mozart and Bach, not to mention my sometime nemesis Arnold Bax, whose difficult viola part of his Trio in One Movement I was just beginning to get under my fingers. There is work to do, but the work will just have to wait. Read the article about it here. It was my father's first season in the orchestra (he began as the last stand of the second violins and became the principal violist the next season). I talked with him about it for the first time the other day. He told me that the conductor, Eric Leinsdorf, told the orchestra right before they played. I actually don't have to, because it seems that the bulk e-mail message I got yesterday from a well-known and well-respected conductor (at least a conductor I respected prior to receiving this message) could have come from any one of a thousand people. This message lauded a particular soloist (could be any instrument--I'm not naming names) as "the most exciting __________ alive today." I was intrigued, so I looked the soloist up on YouTube and found this person (I'm not giving away gender) to be one of the most tasteless musicians I have ever heard. I could even venture to say that s/he is the most tasteless musician alive today, but because I limit my exposure to such players, I am (thankfully) not in a position to make such judgements. It really bothers me that conductors feel the need to sell concerts the way some people sell cars. It also bothers me that the people new to "classical music" who buy the hype and go to the concert will echo the sentiments of the sales pitch even if the playing has left a bad taste in their collective mouths. This kind of publicity shows a lack of respect to listeners, and I believe it ultimately thwarts the greater efforts of musicians who devote their lives to trying to play tastefully. I do know that the city where this conductor conducts has a lively set of musical offerings, and some of them come from tasteful musicians. I hope that fewer and fewer of them buy the used cars hype that this individual is trying to sell, and go spend their leisure dollars elsewhere. ". . . At the same time music has one advantage of other arts, in that, being itself a subtle and intangible entity, it can create its own forms and vary them more completely than they can. But one rule is common to them all; no matter how free the design, the proportions must be preserved if the work is to make any sensible appeal to human intelligence. A new form in music may require study and frequent hearing to understand it, but if it is logical and founded on a thorough knowledge and control of means, time will endorse it. Such modifications grow (like folk-songs in Hungary) and are not made. To have any value at all they must in their nature be children of their fathers. The laws of evolution apply as rigidly to musical art as they do to nature itself. It is not necessary to go out of the way to seek for novelty of design any more than for novelty of expression. No two faces are exactly alike, although the are, eyes, nose and mouth are in the same relative position. To paint a face with two noses or four ears would not suggest novelty of form, but only the imbecility of the artist. Polyphemus, with his one eye in the centre of his forehead, will always be a grotesque monstrosity. In the treatment of form, as in the control of invention, the only path to originality is through sincerity of expression on the lines of natural beauty. The moment originality is forced, extravagance, exaggeration, and bizarrerie become inevitable." I came upon this bit of treasure on the IMSLP this evening. 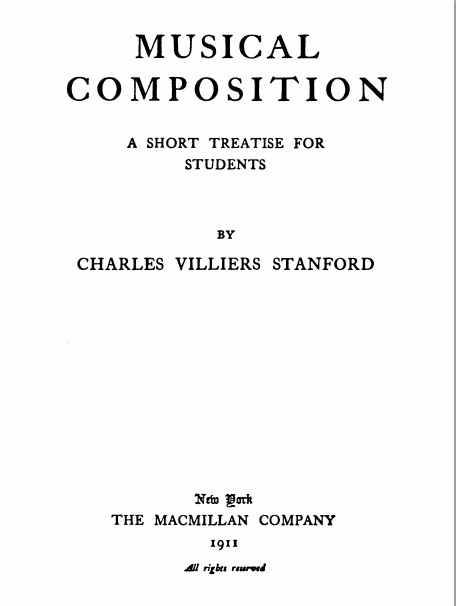 It is just about the best practical guide for writing tonal (i.e. common practice) music I have read. 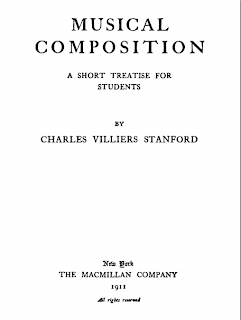 Stanford is sincere, brilliant, and gets to the heart of the how of writing music. Here are a few choice excerpts from the 116-page book. Trust to inspiration for a melody. Do not necessarily be satisfied with the form in which it first presents itself, but work at the details while preserving its balance. When your melody satisfies you, get a bass for it which is as melodious as you can make it without allowing it to overshadow the melody proper. The bass will probably be in your mind as you write the melody. 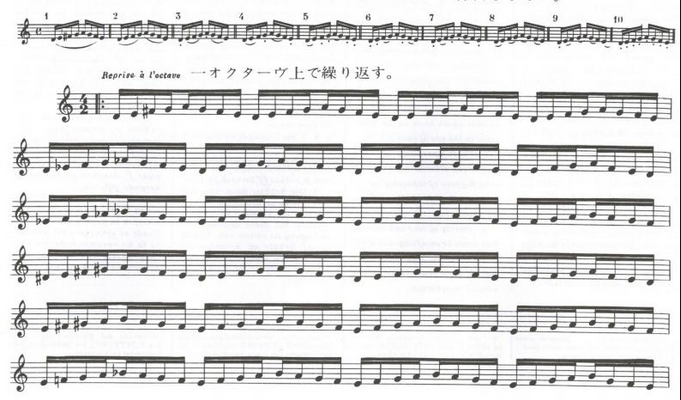 Practice as much as possible in old rhythmical dance-forms, such as minuets, sarabands, allemandes. Vary the number of bars in your phrases, and be careful to balance them satisfactorily to the ear. Remember that sentences to be intelligible must have commas, semicolons, colons, and full stops, and apply this principle to your music. By doing so you will make your phrases as clear to the listener as they are, even in their cruder form, to yourself. Found your melodies on the diatonic scale, and treat chromatics as reinforcements and decorations only, until your themes move easily in diatonic intervals. Study counterpoint first, and through counterpoint master harmony. Practice canonic and fugal writing until the results sound quite easy, natural and musical. Write always some music in any free style, without thinking about rules, alongside your technical work. Learn the value of using plenty of rests. When an artist, who has made a design for mosaic, proceeds to put his picture together, he must make his tesserae so even-edged as to fit easily to each other; if the edges are rough and unfinished, he will not improve the effect of his design by hammering them together and chipping them; nor can he excuse such methods by pleading that the mosaic picture is so far off that no one will see the flaws. The flaws will let in the dust and damp, and the laziness of the inferior workmanship will be exposed by the great enemy of all charlatans, Time. I believe that his advice is still as relevant for composers of the 21st century as it was for composers of the early 20th century. The analogy Stanford makes about the maker of mosaics holds true for every type of artistic endeavor. Perhaps what I love so much about Alma Deutscher is that the music she writes reflects what she knows. She seems to be having the ideal musical childhood, filled with a steady diet of Haydn, Mozart, and Scarlatti. Her father, Guy Deutscher, is an accomplished linguist and an amateur flute and recorder player, and I understand that her mother is also an academic. They are able to give Alma lessons with excellent teachers, provide her with high-quality instruments, and educate her at home, so that she can devote her time to music and childhood. She is a delightful child, filled with real wit and a true musical personality. She clearly has spent time listening to and studying Haydn's Opus 33 Quartets (make sure to listen to the end). She had some seriously original musical ideas when she was six (make sure to listen to the development section about 2 1/2 minutes in). I love the way her interpretation of this Scarlatti Sonata is personal, and appropriately quirky. Some day I hope to play the piano as well as this eight-year-old. 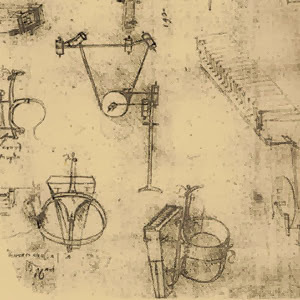 Imagine if Leonardo da Vinci had actually built this instrument 500 years ago (when he designed it)! Here's how it works. 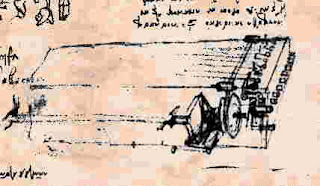 Here's a view from a turning wheel which demonstrates the concept. You can see the person turning the wheel at the end of the instrument in this clip. Here's an animation of the "action" (that's horsehair, not water). Here's a news broadcast about the first crude example from 2009, and an article about Slawomir Zubrzycki's improved model. 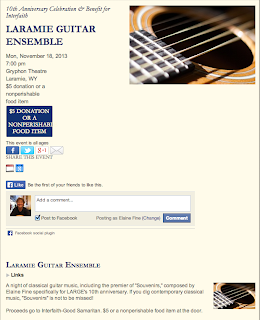 It's the first performance of a piece I wrote in celebration of the 10th anniversary of the Laramie Guitar Ensemble. The thing I love about this video of a violin string in motion, as seen from behind the bridge, is the way the vibrations of the note (started at the tip, where instability is always a possibility) gradually achieve properties that remind me of a jump rope at full swing. With normal vision (in real time) we don't see the parts of a bowstroke that are less stable, but we can hear them. The image of the jump rope and the idea of getting and maintaining full swing as quickly as possible and for as long as possible during any given note helps me focus my attention in a new and exciting way. I love the fact that the swing of the string, once set into motion, continues after the bow leaves it. We all need to pay attention to the microscopic corners and ends of the notes we play. Since a sound wave is a sound wave, I imagine that this image would be useful for all musicians, not just those of us who play bowed strings (there is no way to slow down the visual image of the physical way sound comes out of a wind instrument or a set of vocal chords). What a rare and useful piece of video! 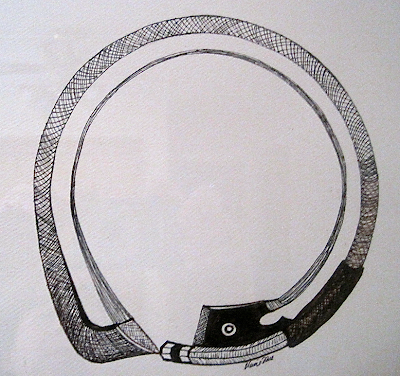 I wrote a piece about jump rope for two violins a few years ago. Who knew? Last summer, after visiting an exhibit at the New York Public Library that displayed, among other things, Federico Garcia Lorca's guitar, I wrote a set of six pieces for the guitar based on lines from some of his guitar-related poems. If you look at the titles here, you will see that each contains a number, and that the third piece of the set is about the three strings of gut and three of silver that are used on Lorca's guitar. Kevin Hart, the dedicatee of the piece, is planning to record them this winter. Special note to Kevin: the tempo of this is really too fast for a real instrument. Composers always pick tempos that are too fast, so I'm just doing what comes naturally. This was 1969. I was ten, and the world was a confusing and large place. 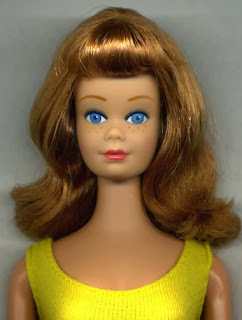 Like most children, I had issues with identity. I was one of a few people who found Mister Rogers' Neighborhood frightening because of the creepy Lady Elaine, who shared my name, and therefore I didn't believe that very calm man who told me that he liked me just the way I was. I only watched the show occasionally. I imagine that the relatively small handful of people named Elaine in my generation understand. I really fell in love with the show when I watched it with my own children, beginning in 1987 when our daughter was born. It was then that I learned to like Lady Elaine "just the way she was," and I began to understand that Fred Rogers was, in addition to speaking to children, was setting an example for parents to try to look at the world from a child's point of view. I imagine that there are other adults can respond to the show from our inner-child's point of view, because so many of the things that trip adults up are fears and habits of response acquired (for whatever reasons) when we are children. The 7 minutes above are very meaningful. I can't imagine such a response from a member of the Senate concerning a request 20 million dollars in our current cultural climate. In many ways Fred Rogers accomplished his task, and we have a few decades of proof, because many people in their 20s, 30s, 40s, and 50s who had the chance to watch the show as children are trying to make the world a kinder, gentler, and more understanding place. PBS no longer shows Mister Rogers' Neighborhood (it stopped airing in 2007), and there are too many things in our consumer-driven culture that trip us up. Those things come from the outside, but the do affect everybody on the inside, children and adults alike. It is wonderful that some of the shows are available to watch by way of YouTube, but because of all the din that is the internet, a small still voice speaking reasonably about things that matter is not always the one that we hear. Peter Sheppard Skærved demonstrates Paganini's tricks and techniques, shows his travel journal, explores iconography of the time, and demonstrates Paganini's steel bow (and explains why Paganini held his bow so high on the stick). The nifty bow stuff starts about 47 minutes into the film. Learn Your 50 States with This Song! 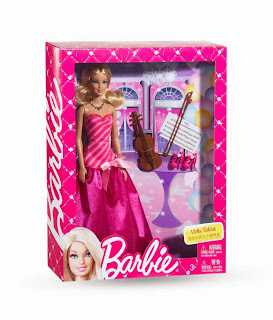 One of my students has a violin-playing American Girl doll (this is someone else's violin student below). The folks at Mattel are trying to jump on the, er, bandwagon. My first impulse when I saw this was to groan loudly. The doll is made for the Chinese market, where lots of young girls play the violin. Many young girls see the attractive array of young women who grace the tubes with their grown-up playing. They also see a wide array of adorable little girls in fancy party dress playing the violin. I have had many a young girl student come for lessons because they were inspired by seeing and hearing a video or two of someone pretty and talented playing the violin. 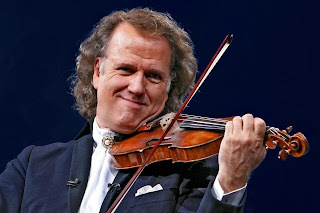 I even had a boy (who is now a young man, and still a violinist) come to me because he loved seeing and hearing Andre Rieu, who is just about as "Barbie" as a male violinist can get. 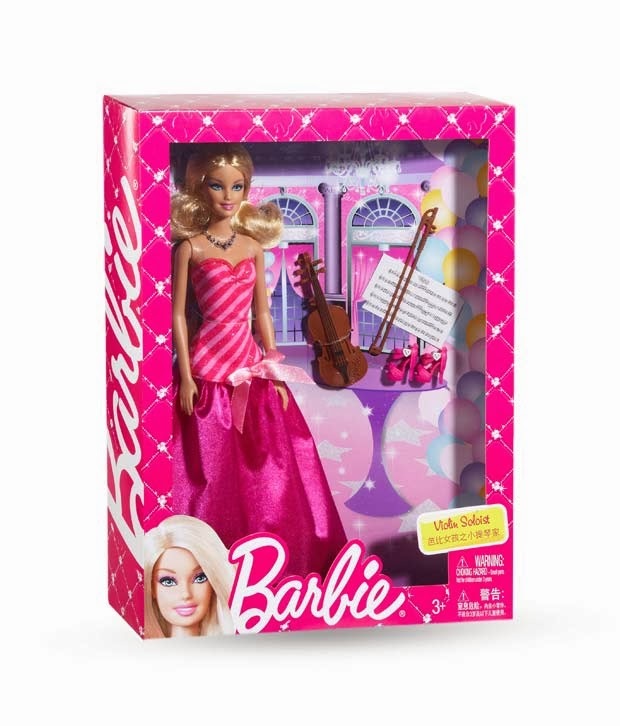 It doesn't look like Barbie's arms would bend to hold the fiddle or the bow, but there is a certain kind of violin-playing kid who would want such a doll. We grown-ups forget about the value of play and imagination. Practically Barbie would not be able to play with that necklace, and those shoes would NOT be comfortable for playing, even if it's imaginary playing. How would "Viola Section Player Midge" sell? The first thing that popped into my mind was "Henle." Yes Michael. This is a hint. I'm three Sonatas into volume I, and would really like to own volume II. Beware the Whims of a Music Editor! I decided it was time to listen to a few recordings of Paul Juon's Opus 15 Sonata since I'm playing it in a week or so. I'm using an edition published in 1946 by International Music that was edited by Milton Katims. The only reason I'm using the Katims is because the edition in the IMSLP prints out rather small. I need all the clarity I can get, so I chose to use the International edition. I figured that an edition from a reputable publisher wouldn't have wrong notes in it. That altered note (as you will hear in the videos below) changes the main theme considerably. I put a query to the 1000-plus-member group of violists on Facebook about the problem, and I didn't hear a peep (though my flutist friend Jean Petree, whose mother is a violist, knew the piece). I imagine that nobody gave that C-sharp (or those C-sharps) a second thought. I wouldn't have questioned it myself if I hadn't come across that Russian recording. Thank goodness for the IMSLP!
. . . because like shoes, they come in pairs. It is with great pride that I am able to share this fantastic reading of Hall Overton's Sonata for Viola and Piano that was recorded on June 22, 1989 during the 17th International Viola Congress at the University of Redlands in Redlands, California. 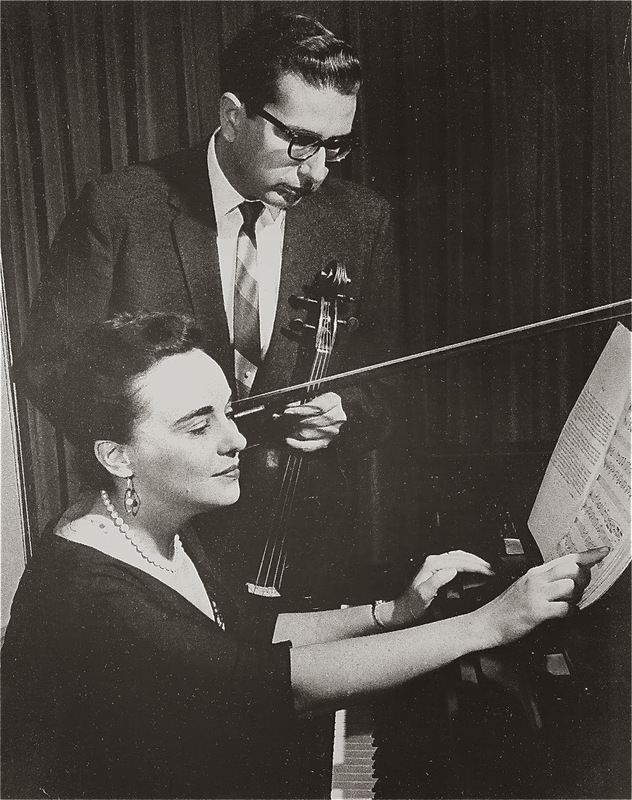 The Zaslav Duo (Bernard Zaslav, viola, and Naomi Zaslav, piano) had a long and distinguished career, and they spent much of it playing new music. 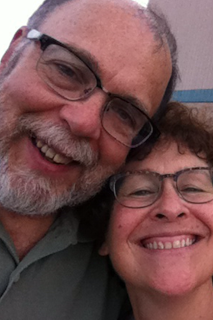 A big thanks to Bernie and Naomi for allowing me to put this recording on line! Bernie's head didn't make it into the image on YouTube, so here is the original picture of the Zaslav Duo (from 1962) in all its glory. I'm playing a concert in two weeks. 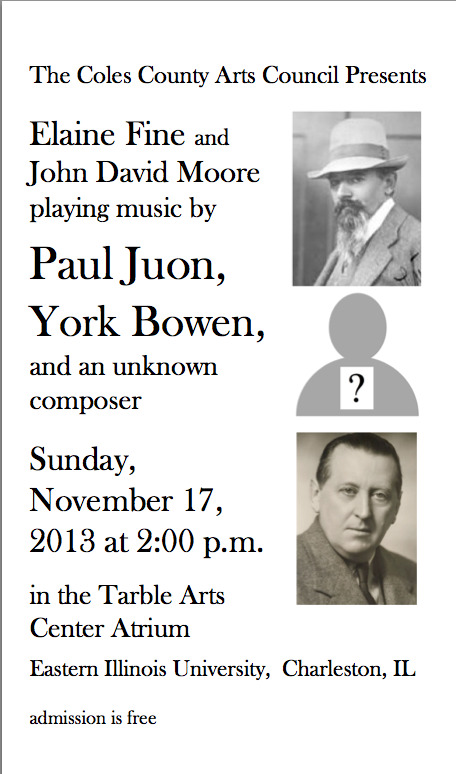 You will, no doubt, notice that between the pictures of two composers of works on the program (i.e., Paul Juon and York Bowen), people not known to most of the non-viola-playing world, there is a mystery composer. I found this group of sonatas by this "mystery" composer in the "Anonymous" section of the IMSLP. 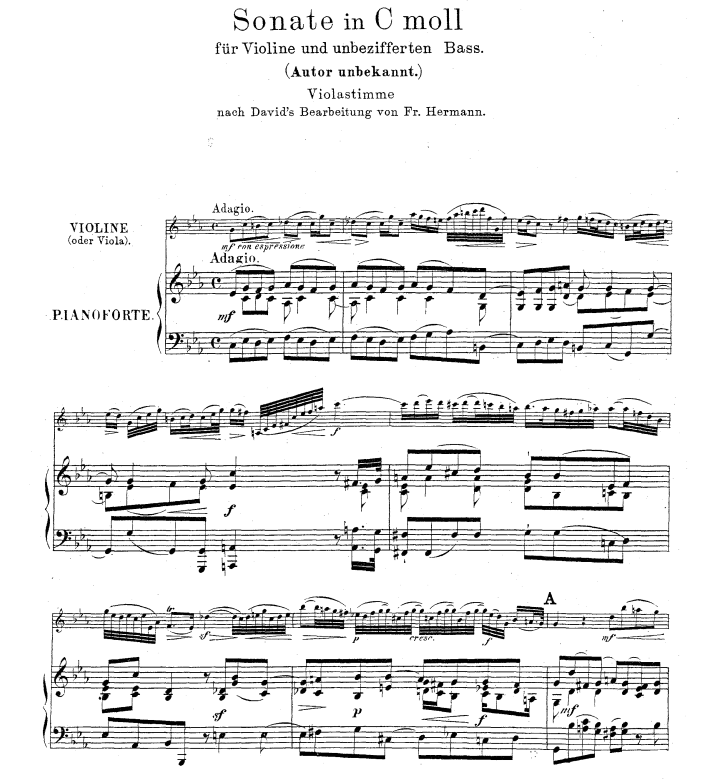 It was "discovered" by the violinist Ferdinand David and transcribed for viola by Friedrich Hermann, who was the principal violist of Mendelssohn's orchestra. It exudes the spirit of Leipzig in the second half of the 19th century, a time when musicians were discovering (and devouring) the music of J.S. Bach after its hundred years of relative obscurity. The burning question I have while I am practicing is whether to incorporate baroque conventions into the 19th-century phrasing (i.e. changing the articuation). This brings up the larger question of authenticity and a composer's intentions (even if s/he didn't attach a name to the work). For the record, I think it's a "he," and I believe his name is Ferdinand David, the first editor of the Bach Sonatas and Partitas, and the dedicatee of the Mendelssohn Violin Concerto. David probably knew very little about 17th- and 18th-century instruments and bows. He also knew little, if anything, about the harpsichord, but he was still a pioneer in the field of baroque music. He was also an excellent composer. This piece for "un-figured bass" is great fun to play. Playing it makes me thumb my nose at claims of authenticity, and it reminds me that the real mandate that this piece of music (or any piece of music) has is to work towards an interpretation that is true to its spirit. I spent some of August, all of September, and a few weeks of October playing through Haydn's Piano Sonatas in order to learn something about piano playing and something about Haydn. I learned a great deal, and had a wonderful time doing so. I have decided to spend the month of November playing through the Mozart Piano Sonatas. Yesterday I played the first, and today I played the second. Now, with this little bit of experience, I understand why pianists love Mozart so much. These Sonatas simply feel good under the hands, and it is so easy to play expressively without having to do anything physically unnatural. What a treat this is! And it's a treat that anyone with a keyboard and minimal piano skills (thanks to nearly three months of daily practice I can finally trill with one hand and play an Alberti Bass with the other) can give him or herself. And the music is even available for free in the IMSLP. Perhaps some readers might like to join me in this adventure! The word "Movember" has already been taken by people who are capable of growing facial hair, so, perhaps those of us who enjoy playing the piano can have our own "Movember" by playing Mozart every day. Of course people who play other instruments are welcome to join, though there would have to be considerable repetition to fill all 30 days of November (not that there's anything wrong with that). If you're a man, you could do both. 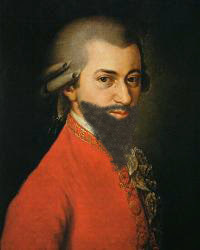 Grow a beard and play Mozart. I imagine that at some time in his life Mozart might have had some facial hair. After being married for 29 years to the person the blogosphere knows as Mr. Orange Crate Art, I'm happy to say that we also keep one another entertained at home (i.e. in real life). His glasses may be fogged, but mine are not. Life is great in our little house in our little town, and we are still very, very happy together. The last part of this video has an interview with Marcel Tabuteau. By demonstration he makes the case that musicianship has everything to do with personality, while stating that his method of teaching makes music into a disciplined intellectual activity rather than one of feelings (because there are days when you might not feel that good). Clearly his cup ran over with an abundance of both. Next Sunday, October 6th at 2:00 the Eastern Illinois University Collegium Consort will play a concert of English Renassance music at the Wesley Methodist Church on South Fourth Street in Charleston, Illinois. We're playing the concert to honor the 90th birthday of Robert W. Weidner, the scholar who transcribed the music into modern notation. 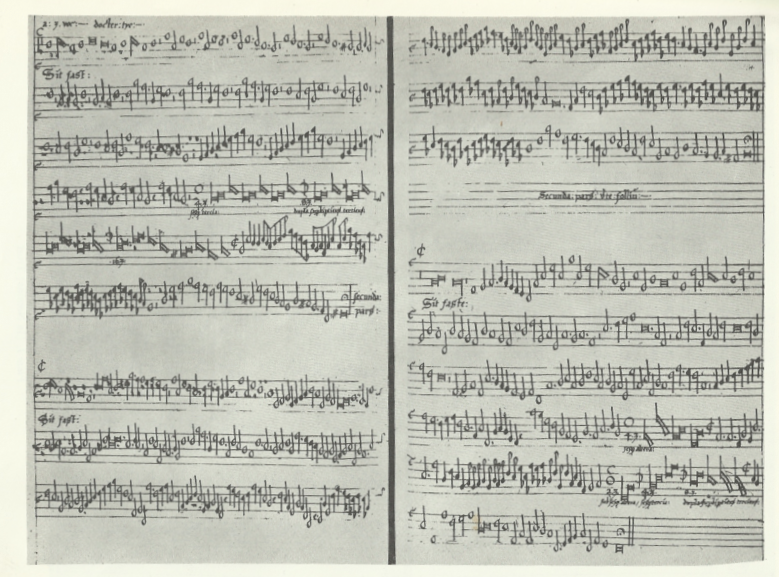 Dr. Weidner spent his career teaching music history at Eastern Illinois University, and people around the world have benefited from his work making instrumental music of the English Renaissance accessible. We will also be playing several instrumental pieces that use the "In Nomine" section of a mass by John Taverner as a cantus firmus. One is by Taverner himself, and the rest are by Christopher Tye, Robert White, Alfonso Ferrabosco, and Thomas Tallis. Dr. Weidner came to our rehearsal today, and he described one of the cadences as "very handsome." I like that. A handsome cadence. Rosemary Buck, Elaine Fine, Peter Hesterman, Charles Hughes, Jeri Matteson-Hughes, Ruth Riegel, and I will be playing various recorders and stringed instruments, dulcian, sackbut, and crummhorns. 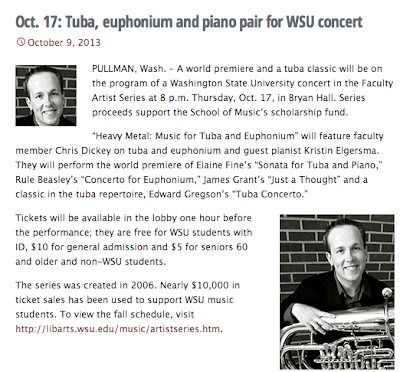 The concert is sponsored by the Coles County Arts Council, and admission is free. 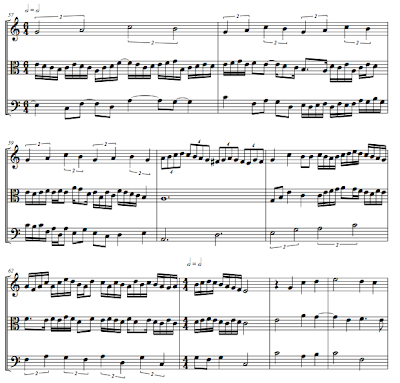 Here's a brand new set of pieces I wrote for clarinet and viola (three character pieces and one transcription, to be exact) that I just put in the IMSLP. One character piece is modal, one is 12-tone (with only three deviations from strict "by-the-book" 12-tone writing), and one is pure Marxian (as in the Marx Brothers). 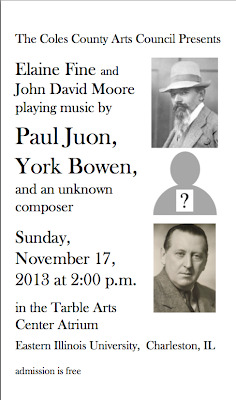 The piece is dedicated to my violist friend Lydia Tang and our composer friend Peter Michalove. 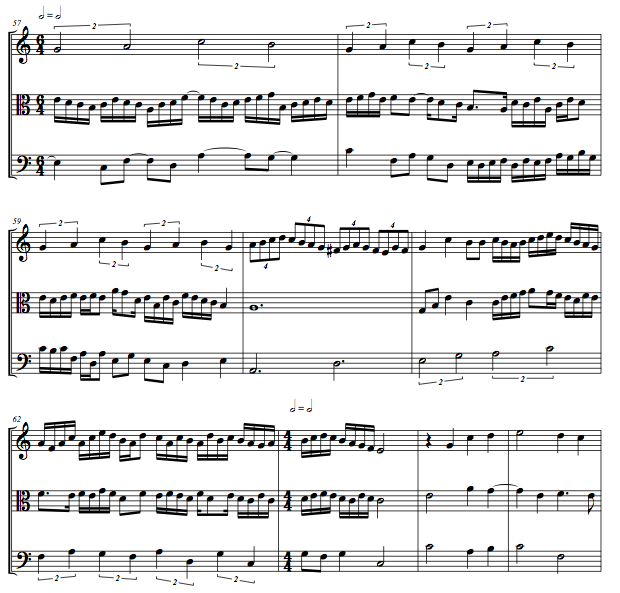 The transcription is of the Haydn Trio I wrote about last week. You can see the music here, and listen to a computer-generated recording here. Spiral binding is fine, and it is often quite useful, but sometimes I want to have music that can lie flat. Sometimes I have scores that require paper that is too big for my comb binding machine. I tried my luck with masking tape, but cloth athletic tape, which has the forgiving quality of being removable (if necessary), is the perfect solution. You can use it to repair books too. I remember learning about the word "Gens" from a History course I took in high school. Our teacher, Dr. Burnham, who became a full-time poet after he retired, told us that the point of the "Gens" was to propagate a Genius. All my etymological sources tell me this isn't true, but until now I always considered Dr. Burnham's speculation to be correct. I loved studying history, and if I didn't go through my young life with the belief that I would go into music as a profession, I probably would have gone to a real college (Juilliard was a conservatory) and would have studied history and/or geography. Towards the end of Gunther Schuller's talk last Wednesday, he mentioned that he was a ninth-generation musician, and that contributed to his success as a composer (success meaning the ability to come up with ideas and write music that pleases him). It occurred to me that, taking his German relatives into consideration, his genius (and it is genius) could very easily be traced to the multiplicity of composers of the Baroque period in Germany. If a generation is 33 years, the first professional musician in his lineage would have been around in 1716. By the Burnham "Gens" principle, he could be the "Genius." Schuller spent much of his childhood at a boarding school in Germany (studying all his subjects in German), and his English does have a slight German tinge to it. 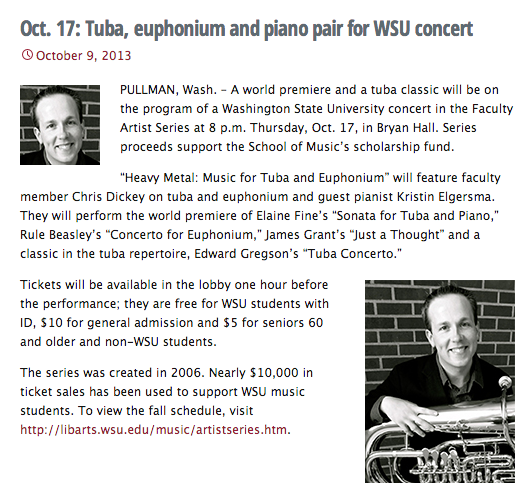 He loves organization, which is one reason he loves writing 12-tone music. He still writes his very interesting (and singular) mixture of 12-tone music and jazz, and has been generating it from the same row he's used since 1976. I mentioned something about his memoir before he began his talk. He told me that he included all the names of the people he worked with in his index. I told him that I read a review copy (without an index), and was thinking that this book would have one hell of an index. I told him about getting a professional indexer to do the index for Bernie Zaslav's memoir. His response was "I did it myself. I love indexing." There you have it: a great organized mind doing what it likes best. I have also been thinking about the statement Gunther Schuller made about hating the word "interpret" and loving the word "realize" when it comes to playing music. After thinking about it for a while, and after thinking about his music, I understand his viewpoint. I also know that it is the polar opposite of mine. I love the idea of leaving the ultimate meaning to something I write to the people playing it. I actually absolve myself of "ownership" once a piece is completed, and I love the fact that it could be played in many different ways by many different people, while still following all the pitches, phrase markings, articulations, and dynamic markings. I imagine that Schuller's musical brain works a little bit like the brain of Arnold Schoenberg (though his personality is quite different), which brings to mind the first post I put on this blog, which I called "Reconsidering Perfection." Both composers have ways of thinking that I find fascinating, and both write music that I admire, but what I have for both composers is admiration rather than identification. In this vast world there is room for much more than one or two ways of thinking. Gunthur Schuller talked about his goal of melding the two "camps" of Schoenberg and Stravinsky in his music. Now, thanks to the many investigations by musicologists and the opening up of resources by way of the internet (the IMSLP, the Internet Archive, the Worldcat, YouTube, Wikipedia, music blogs, and Jstor), we know that there have always been far more than two "camps," and that there is room in this musical world for all sorts of musical expression. I find it really interesting that Gunther Schuller became so attracted to Jazz, a medium that is built on improvisation, when he himself did not feel comfortable as an improvising musician. He sought out what was external to his experience and comfort, and he made a huge contribution to the work of Jazz musicians by doing what he was good at. I find it interesting that both his sons, the bass player Ed Schuller, and the drummer George Schuller are accomplished Jazz musicians. Like many of us, Gunther Schuller had children who were able to do something well that he was unable to do, like improvise. Someone asked Mr. Schuller about the various kinds of music and various ways of writing music that are around today (it was a young crowd, and he was viewed very much, at almost 88, as a composer of the past, though he is a composer of the present because he's still writing). He said that he wasn't impressed by music that was generated mathematically, and he considered most minimalistic music repetitive, though he did mention that he liked Steve Reich's work. After Gunther Schuller's talk, I was excited about trying my hand at 12-tone music again (I haven't used a tone row in years). I found a nifty row, put the pitches on an squared index card in the original order and in inversion, and then I generated rows from every chromatic step of the scale. I had a grand time playing with it, and I turned some of the music I found using the row into a piece for viola and clarinet. 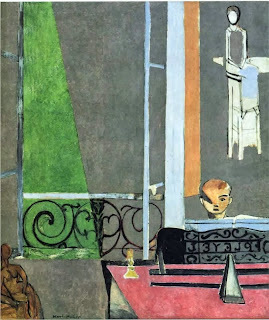 It is liberating to be able to escape from tonality for a while, but the very thought of only writing music generated from that row for the next 37 years feels stifling. Organized atonality is an interesting country to visit, but it's not a place where I feel at home.